Capable of drilling wells in water up to 40 feet in depth, “Mr. Charlie” in 1954 became the first mobile offshore drilling platform. Photo courtesy Murphy Oil Corp.
Offshore oil wells were drilled on Grand Lake St. Marys in Ohio as early as the 1890s, according to Mercer County historians. In California, offshore oil wells were drilled from piers beginning in 1896 at Summerland in Santa Barbara County. In the Gulf of Mexico, a Kerr-McGee drilling platform, the Kermac Rig No. 16, in 1947 became the first offshore rig in the Gulf of Mexico that was out of sight of land. By the end of 1949, the Gulf’s offshore industry had discovered 11 oil and natural gas fields. Constructed in a New Orleans shipyard, in 1954 the barge drilling platform Mr. Charlie became the world’s first mobile offshore drilling unit (MODU). Natural seeps leak thousands of tons of petroleum a day – and have for several hundred thousand years. The Environmental Protected Agency was established a year after a Union Oil Company drilling platform in 1969 suffered a blowout six miles off Santa Barbara. Today, exhibits at the Santa Barbara Maritime Museum explain the continuing process of oil emerging from natural seeps in the channel – and visited by tourists in boats. The complexity of offshore exploration and production has led to many new technologies. In 1948, Shell Oil Company and others pioneered the use of underwater television cameras for survey, inspection, and repair work. The Navy also developed deep sea technologies for submarine rescue. Despite state-of-the-art robotics, offshore petroleum industry and scientific needs for manned deep sea diving continue. In 1894, Henry Williams drilled two wells on a California beach. He drilled another in 1895 with encouraging results. This led Williams and others to exploring for oil offshore the next year. In 1911, Gulf Refining Company abandoned the use of piers. It drilled Ferry Lake No. 1 on Caddo Lake, Louisiana, using a fleet of tugboats, barges, and floating pile drivers. Today, more than 5,000 offshore oil and natural gas platforms operate in the Gulf of Mexico around the clock. In 1845, Grand Lake St. Marys in Ohio was the largest man-made body of water in the world at 17,500 acres with a depth of about seven feet. The lake supported commerce of the Miami and Erie Canal. Mercer County documents record oil production from wells pumping on platforms on the lake more than 40 years before Ohio’s first real oil boom. A circa 1920 view of oil piers at Santa Barbara, California, beaches; a historical marker at Caddo Lake, Louisiana, erroneously claims oil wells drilled in 1911 were “the world’s first over water.” Searching of new reserves, Kerr-McGee Oil Industries pioneered offshore drilling in the Gulf of Mexico and proved the feasibility of tender-serviced oil platforms at sea. Petroleum companies operating in the Gulf of Mexico’s outer continental shelf routinely provide the government with sonar data for areas with potential archaeological potential value. A 2001 archaeological survey by BP and Shell prior to construction of a natural gas pipeline confirmed discovery of the World War II German submarine U-166 about 45 miles off the Louisiana coast. A federal program benefits the U.S. economy and the environment by using offshore petroleum platforms to create artificial reefs for ideal marine habitats. 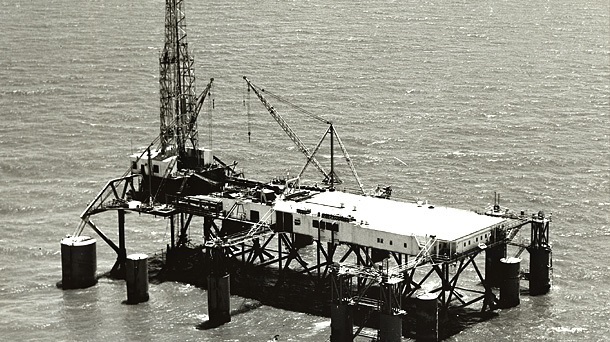 Beginning with an Exxon experimental subsea structure in 1979, the “Rigs to Reefs” program has formed the world’s largest artificial reef habitat in the world. Much of today’s offshore oil and natural gas industry relies on remotely operated vehicles that can trace their roots back to Howard Hughes, Jr. In 1960, Shell Oil and Hughes Aircraft began modifying a landlocked “Manipulator Operated Robot” – known as MOBOT – into one that could operate underwater. The result led to the ROV (Remotely Operated Vehicle), which revolutionized offshore petroleum exploration and production.